This Pleasant Hearth non-catalytic wood burning stove will warm your heart and your home with highly efficient and effective indoor zone heating. This stove has been EPA certified with emissions at 3.9 g/hr. Perfect for single-family or mobile home use with little assembly required. All Pleasant Hearth wood burning stoves feature a brick lined firebox, chrome handles, air wash system that automatically maintains the cleanliness of the glass window, front-loading solid cast iron door with large ceramic glass viewing area and a 5-year limited warranty. Stoves operate best when fuelled with seasoned cord firewood. Heating coverage area is up to 1,200 sq. ft.
Up to 50,000 BTU's/hr. heats up to 1,200 sq. ft. The Dimplex 1500W Compact Electric Stove gives you all of the cozy ambiance of a wood stove with none of the mess. The matte black finish, working door and traditional details make it a perfect addition to any small space. Fully assembled, this unit can be used in any room of the home, cottage, trailer and more. Take it with you to create a warm atmosphere anywhere you choose. 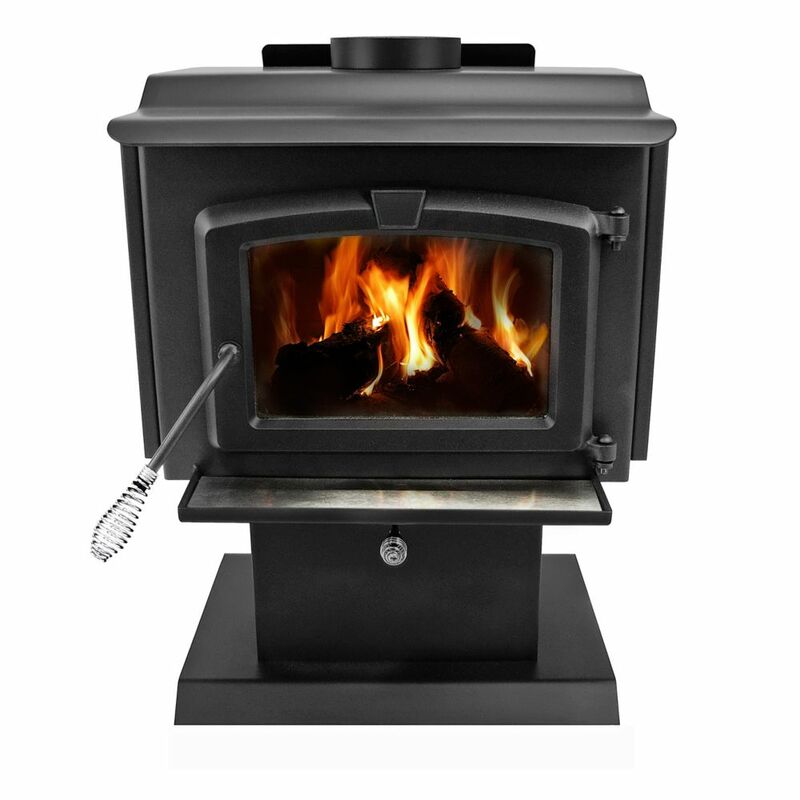 The HT2000 is a high efficiency, EPA certified wood stove. It has the largest combustion chamber of all appliances in the XL wood stoves category. With its moulded C-Cast baffle, the HT2000 offers unmatched durability. Wood logs can be loaded over width or depth, making the HT2000 one of the most sought after units in the industry. Heating up to 1,800 sq. ft., this Englander wood-burning stove features a 1.8 cu. ft. firebox that holds logs up to 18 in. long. Stainless-steel tubes and ceramic fiberboard construction help create a clean, hot burn that lasts for hours, keeping your living space warm all season long. A beveled door design with a large door glass makes this stove a perfect fit for any moderately sized home, and its EPA-certified design is also approved for use in mobile homes. This impressive Multi - Fuel Stove offers an array of heating options by burning corn, wood pellets or cherry pits, making it a versatile alternative fuel burner. The realistic brick - patterned fiberboard in the firebox and decorative cast door provide a certain classic charm, combined with the modern convenience of a user - friendly control panel pre-programmed for different fuels. With a large ash drawer for clean-out, this stove also features the unique, multi-fuel auto-start igniter to light the toughest fuels, including corn. The unit is designed and tested to heat up to 2,200 sq. ft., with a 50 lb. hopper feeding the firebox. 1,200 sq. ft. EPA Certified Wood-Burning Stove with Small Blower This Pleasant Hearth non-catalytic wood burning stove will warm your heart and your home with highly efficient and effective indoor zone heating. This stove has been EPA certified with emissions at 3.9 g/hr. Perfect for single-family or mobile home use with little assembly required. All Pleasant Hearth wood burning stoves feature a brick lined firebox, chrome handles, air wash system that automatically maintains the cleanliness of the glass window, front-loading solid cast iron door with large ceramic glass viewing area and a 5-year limited warranty. Stoves operate best when fuelled with seasoned cord firewood. Heating coverage area is up to 1,200 sq. ft.
1,200 sq. ft. EPA Certified Wood-Burning Stove with Small Blower is rated 3.6 out of 5 by 75. Rated 5 out of 5 by cozy from It is the perfect size to heat our home. ... It is the perfect size to heat our home. It will save us money because there is no longer the need to keep buying propane to heat the house. My husband is quit happy with the size, ease of use and the heat it give off. Rated 2 out of 5 by Burntguy from It's not as good as my 1973 model earth stove that my insurance company insisted I replace...mobi... It's not as good as my 1973 model earth stove that my insurance company insisted I replace...mobile home approved they said Ugh. Same size as my old stove , uses 50% more wood and gives less heat. I wake up cold every morning and now wear a sweatshirt in the house. Efficient, green, EPA approved, all words in ads to let you know you're buying crap. Also, I've burned my arm countless times due to a user unfriendly door. Same door that drops fire and filth on the floor every time I open it. I miss my old stove. Rated 2 out of 5 by HomeDepotCustomer from draft control not very good, can not up draft enough.... draft control not very good, can not up draft enough. Rated 5 out of 5 by Jean from Lovely stove, works great!... Lovely stove, works great! Does this unit come with the bricks?